The art class starts serenely. Standing poised before its easel, the creature?s tail swishes and ears gently flap. Then, brush held in the tip of its trunk, this most imposing of land mammals deftly drags a streak of paint across the page. At first the sense of awe limits itself to the dexterity at work, but as the seemingly arbitrary squiggle takes on the likeness of the creature itself, wonder fills the air in gasps of ?Oh my goodness!? from the watching American tourists. 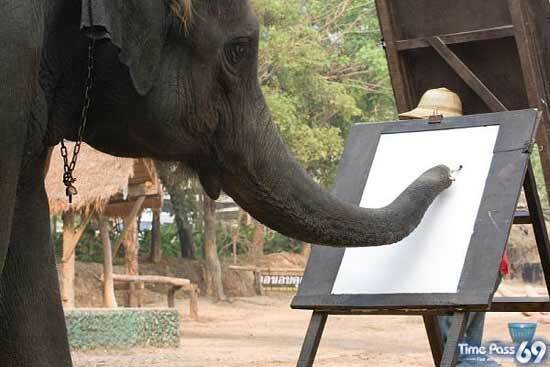 Art has arrived in the animal kingdom.